Once the snow clears this spring, you can finally see the surface of your driveway. The harsh winters in Toronto are never kind to it, damaging the surface terribly. Every year, you’re dismayed to see deep cracks running along it, and every year you let the travelling driveway sealers come to put on a new coat of tar. But this doesn’t fix the problem; their seals only cover the cracks until the next winter makes them bigger. Stop wasting money on treatments that do nothing to improve the look of your driveway. Choose stamped concrete laid by a professional contractor to finally fix your driveway woes for good. Stamped concrete is a reliable and dependable material that will last a lifetime. Your driveway sees a lot of traffic. You and visitors walk on it every day, and your heavy vehicle sits on it for hours. That’s why expert contractors lay your stamped concrete in a single slab that is 5 inches thick, guaranteeing a strong foundation for whatever traffic your driveway sees. When treated and sealed properly, your stamped concrete can withstand harsh climates without damages. A professional contractor will use sealants that insure your driveway against colour fading, and its non-slip additive will greatly reduce your chances of slipping in the winter. Unlike the black tar seals that you’re resigned to every spring, stamped concrete is incredibly versatile. You have a staggering array of design options awaiting you. With the proper finish, your driveway can take on the look of more expensive materials like flagstone or other elegant stones, upgrading the quality and worth of your home. A professional contractor with experience will always provide the best results. Unlike those travelling companies that reseal your driveway in an afternoon, an expert contractor will have the skill and resources to totally rebuild your driveway. 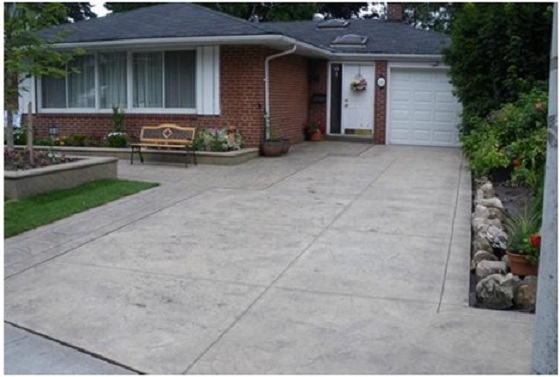 If you’re looking for a concrete contractor in Toronto, you should contact Elite Concrete. Their services won’t just cover up years’ worth of cracks; rather, they’ll be installing a surface that can withstand the heavy traffic your driveway sees. Seek out a business that has been around for at least five to ten years and has amassed an impressive array of positive customer testimonials. You should be able to browse their impressive portfolio of completed job, so you can compare their high customer ratings to actual samples of their work. You’ll quickly find that the same expert contractor that helps you with your driveway can totally redesign your entire landscape. With stamped concrete, the right contractor can give your driveway the look and durability of a much more expensive material. It will add curb appeal to your home, making you the envy of your neighbourhood. But more importantly, when spring melts the snow of winter away, you won’t be faced with a cracked and damaged driveway.